It's finally here, the last chapter of the Resident Evil movie franchise. Hubby and wife of director Paul W.S. Anderson and actress Milla Jovovich have milked this video game franchise for all they can get. And to be honest, as far as video game-based movies go, they've done a fantastic job with it. 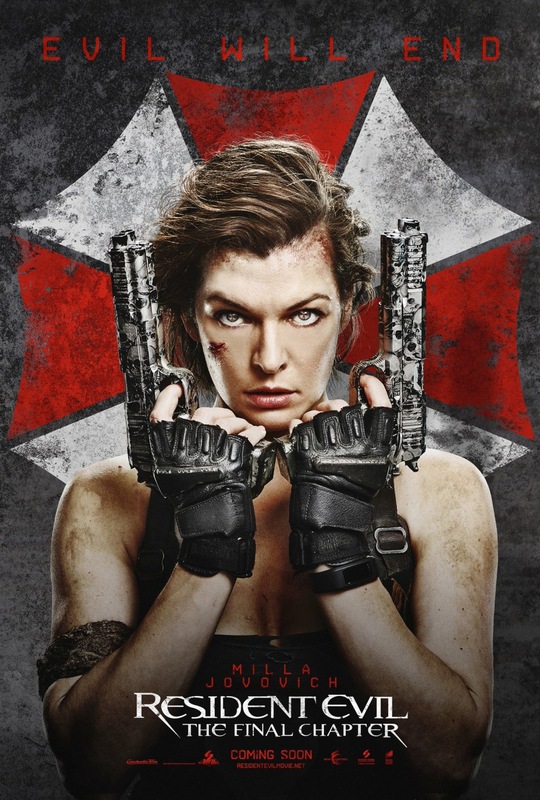 Be it as it may, Milla Jovovich reprises her role as Alice, along with Ali Larter as Claire Redfield, Iain Glen (GoT) as Dr. Alexander Isaacs, Shawn Roberts as Albert Wesker, Ruby Rose (“Orange Is the New Black”) as Abigail, Eoin Macken (“The Night Shift”) as Doc, William Levy as Christian, Fraser James as Michael, and Rola, as Cobalt. It's due out in theaters in late January, 2017. This first trailer looks much like all the other films put together, where fan boys can drool about the hot Alice and others can drool about the digital destruction and death doled out. The first time through for me, it was not that exciting to see. It seems like they might have taken a page out of the book of the Suicide Squad movie trailers. But I have been a fan of this film franchise from the beginning because of its base appeal of hot chicks killing hungry monsters. It's not different than a TV show, just with a lot fewer episodes over a longer period of time! Below are two trailers.... the first one is a music video-ish trailer, along the lines of how WB tried to make Suicide Squad feel. THE SECOND trailer is the international trailer, and it's a much better look and feel to just how the upcoming film will be like. Check out the first trailer for Resident Evil The Final Chapter. Here's the smarter feeling, international trailer.